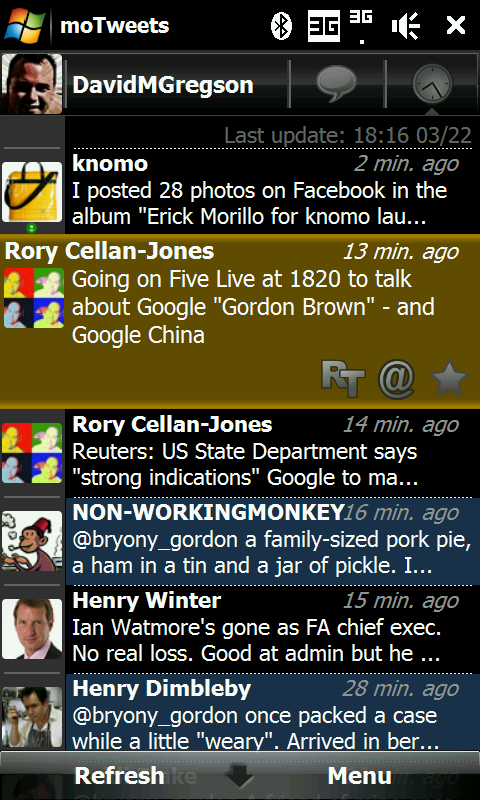 So, in my never ending search for the perfect Twitter client for Windows Mobile I’ve been through most of them, finally settling on Pocketwit and TouchTwit. Ultimately having bought it TouchTwit let me down and started hanging the phone a lot again so that left me with Pocketwit. I had another look around as I liked the layout of TouchTwit and came up with Panoramic moTweets, it has pretty much the same layout as TouchTwit, hasn’t hung once, loads quickly and looks nice. # ReTweet, Follow, Unfollow, Direct messages, Replies, Favorites and much more! For me it pips Pocketwit at the post for supporting lists, and the upload to Twitpic is working properly, and the favourite, retweet and @ response quick buttons in the post. I’ve been using it for three weeks now and remarkably its now the only Twitter client on my phone, that must mean its good as its ususally got three or four on it! It comes in two flavours, the free version is ad supported, it displays a small advert at the top of the screen, personally though I think its so good its worth paying the £2.69 they want for the ad free version on the MarketPlace ~ look at the reviews there to see why its got to be the best client so far!